HEAVY LEATHER NYC NOW SOLD AT RUDY'S MUSIC, NYC!!!! 169 West 48th Street which is on the west end of 48th Street between Sixth and Seventh Avenues. 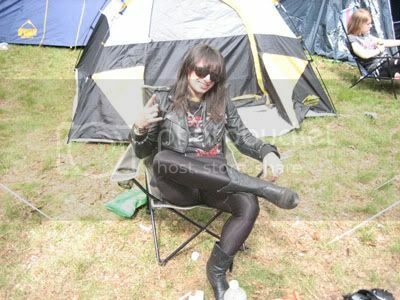 LEATHER, DENIM, HIGH TOPS AND METAL! Lemmy (motorhead) wears HEAVY LEATHER NYC guitar strap, on the BIG screen. The closest I could get to being right there with him! A RECAP OF THE EURO-ADVENTURE!!!! 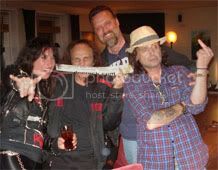 HEAVY LEATHER NYC ----- meets TWISTED SISTER, Lemmy Kilmister AND Phil Campbell buy new guitar straps, I get drunk with LEMMY, get drunk with PHIL, meet ZZ TOP and pass on some killer straps, Get trashed with DIO and ROCK THE SWEDEN FESTIVAL IN STYLE!!!!! I just returned from a most EXCELLENT European vacation! A totally epic trip! 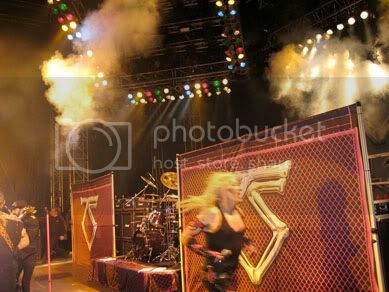 Checking my bags at the NYC airport, I look to my right and the long curly blond hair of Dee Snyder catches my eye- Twisted Sister were on my flight. Excellent!! Previously I made a strap for JJ French (gave it to him at a NYC signing) and so I ask Dee if he remembers me- and of course he thinks I'm nuts. But he comes to and replies "oh, yea... your the Strap Girl".... DOUBLE EXCELLENT!!!! 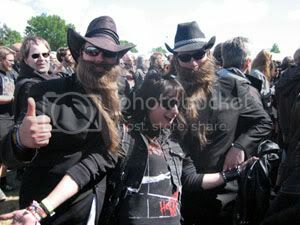 So I arrive in Denmark for Sweden Rocks Festival and drive to Sweden, set up camp with some Spanish friends (4 days of rock, metal, beer and camping!) PARTY TIME! I get some beers and find myself a few hours later watching ZZ TOP backstage, aside Twisted Sister. I look to my right and appears Lemmy Kilmister of MOTORHEAD. PARTY! Its freazing out and I'm visibly shaken so when I say hello to Lemmy he invites me to his trailer to warm up with a Jack n Coke (so hospitable! ha!). But before I can relax, I must introduce myself to ZZ TOP... I made custom ZZ 'Eliminator' straps for them and my mind is set to give them the straps personally. And, 5 minutes later I'm drinking beers with Dusty Hill. DOUBLE PARTY! I took a photo with these guys just in case.... ! The next night Motorhead plays and Lemmy is off to the next venue early, well before the rest of the band. So I take his leftover hotel room and bring my friends with me. We settle into the room, I am about to take a shower when my friend announces Dio (HEAVEN AND HELL) is drinking in the downstairs bar. 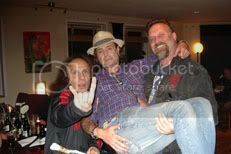 We run down (I'm suddenly VERY thirsty) and get TRASHED with Dio, the SABBATH crew and Phil Campbell, Mickey Dee of Motorhead & co! TOTALLY EPIC!!! The next day Heaven and Hell played and, well, it wasn't their best show- that's for sure! Then, off to Ibiza, Spain for a few days... followed by Barcelona for the weekend. A ton of new records, some savory food and drink, a city of amazing people. A great time, a total success! I'll be back next year! So, finally my website is up and running. Check it out, you can just browse or purchase straps off of it. And don't forget about custom orders! Have an idea for a strap? I can make it! Can you guess which one I am? I'll never tell!!!!!!! LEMMY FROM MOTORHEAD WEARS HEAVY LEATHER NYC!!!! CHECK EM' OUT NEXT TIME YOUR IN FOR NEW GEAR! HEAVY LEATHER NYC GUITAR STRAPS NOW SOLD IN GUITAR SHOPS, NYC!!!!!! ARM YOUR AXE WITH MY GUITAR ARMOR!!! !